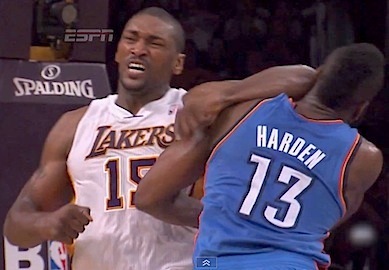 Metta World Peace (formerly Ron Artest) was suspended for 7 games after his brutal hit to Oklahoma Thunder’s James Harden. In a statement to reporters after the game last on Sunday, April 22 where he apologized profusely. He also wrote that he watched the replay, admitting that it looked “bad.” Solid 6th Man Of The Year candidate James Harden is going to be fine. He suffered a concussion but is “feeling good” according to his Twitter. You in idiot, Artest, is the Pshyco!! Next Next post: Funny Video: Star Wars – Attack Of The MODELS!